What is the Difference Between a Restraining Order and a Domestic Abuse Protection Order? 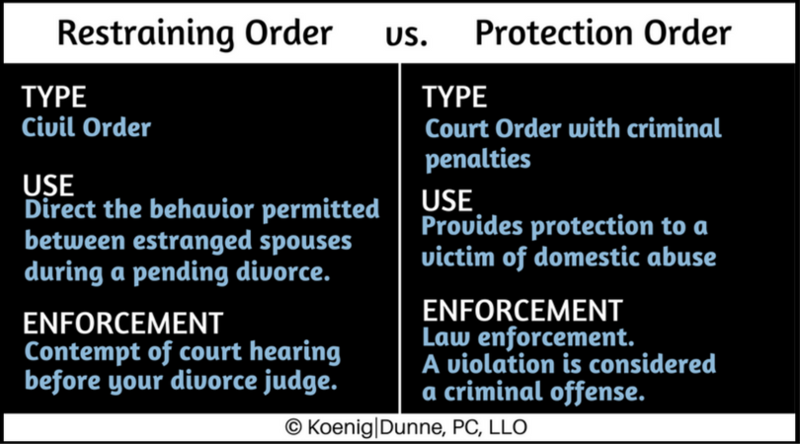 There is a distinct difference between a restraining order and a domestic violence protection order in a divorce case. Restraining orders and protection orders are both court orders that direct a person to engage or not engage in certain behavior. A restraining order may be issued in a divorce case regarding multiple aspects of your case. For example, a restraining order may instruct both parties not to display any behavior meant to harass, insult, or intimidate the other spouse. It may also order both parties not to take any actions that impact the marital estate, including transferring, hiding, or disposing of assets. While a temporary restraining order in a divorce case is a valid court order instructing the parties to behave a certain way, the enforcement of a restraining order is limited compared to that of a domestic violence protection order. If one spouse violates the restraining order, the other spouse must file a contempt of court action against the violator before the order can be enforced by the Judge. Because restraining orders are civil orders, law enforcement cannot enforce these types of orders. A domestic abuse protection order is a special type of court order that may be sought if you’ve experienced bodily harm or if your spouse has engaged in conduct that terrifies, threatens, or intimidates you. If a protection order is granted, the relief is much more extensive for the party seeking the order. For example, the court may prohibit your spouse from contacting you or your children, remove your spouse from your marital home, or determine temporary custody of your children. Unlike a restraining order, a domestic abuse protection order is enforced by the police or sheriff and a violation of the protection order is a criminal offense. Discuss with your lawyer about how a temporary restraining order may protect you and your assets during the divorce process and whether an order would be beneficial in your case. If your safety or the safety of your children is an issue in your divorce, develop a safety plan and legal strategy with an attorney who understands the complex nature of domestic violence and who will partner with you for your protection.